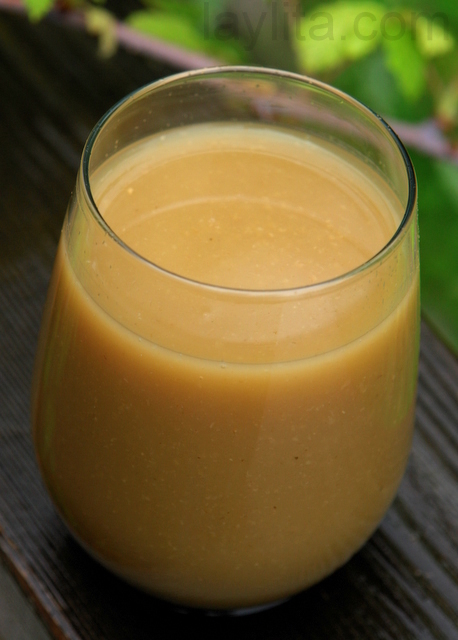 Colada de avena con naranjilla, also known as refresco de avena or sometimes just quaker (after the brand), is a refreshing drink made from oats and fruit. Colada is typically served with breakfast, lunch or as an after school drink for both kids and adults in Ecuador. 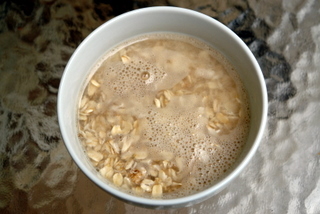 The most basic version is made with oats, water, cinnamon, panela or hard brown sugar, and a very tart fruit called naranjilla, also known lulo in Colombia.There are other different variations of colada or refresco de avena: some add milk; some are made with different types of fruit such as pineapple, maracuya or passion fruit, babaco or mountain papaya; some add additional spices and aromatic herbs.There is also a very special version called colada morada or purple colada, which is made using purple corn flour along with purple or dark blue fruits, and a lot of unique spices; the colada morada is prepared especially for Dia de los Difuntos or Day of the Deceased on November 1st. 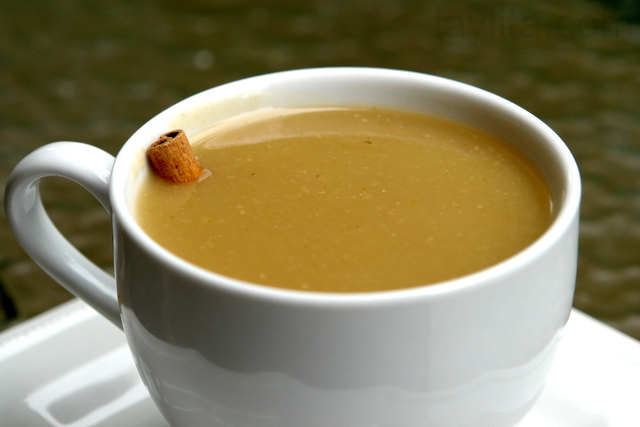 Colada de avena is a traditional Ecuadorian fruity oatmeal drink, it is made with oats, naranjilla fruit, panela or brown sugar, water and cinnamon. 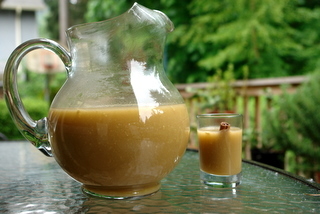 Colada can be served cold on warm days or warm during cold winter days. If using whole naranjillas, cut them in half and scoop out the flesh, then blend the flesh until a smooth pure is obtained. 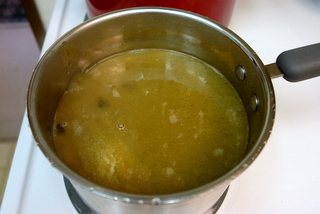 In a saucepan combine the 6 cups of water and half of the naranjilla puree or pulp, the cinnamon sticks and the panela, bring this mixture to a boil, reduce the heat and simmer for about 30 minutes. Remove and let cool down until safe to handle, at this point strain the warm naranjilla and cinnamon mixture. Blend about 2 cups of this mixture with the soaked oats and the remaining naranjilla puree or pulp. Strain the blended oat mixture and combine it with the strained naranjilla mixture in a saucepan and bring to a boil on medium heat, stirring occasionally, let it boil until it thickens and loses the raw oat flavor, about 5 minutes. Remove from heat and strain again if desired. Serve warm for breakfast or on cold days and cold with ice on warm days. If you’re a regular reader of this blog or are pretty familiar with Latin American food you are probably familiar with panela or piloncillo. 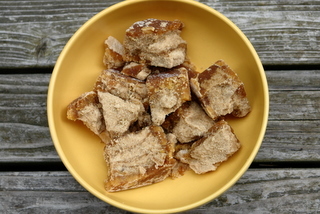 But for those who are wondering what it is, it is basically hard brown sugar and comes in a brick shape (though I’ve also seen it in cone shape). Panela is made directly from sugar cane juice, in Ecuador it is made in trapiches, which is a very rustic processing area, we had a few close to our farm and we had a small field of sugar cane and when they were ready to harvest the canes are cut with machetes (the bases are left and grow back), then the sugar cane is loaded unto donkeys (which are wearing these special wood devices to carry the sugar cane),next the sugar cane is taken to the nearest trapiche, where it first goes through a press that squeezes the juice out. The juice, which is called guarapo and is delicious mixed with bitter orange juice, is then cooked in these large rectangular metal devices (that have fires going underneath) and stirred with these huge wooden spoons (that almost look like kayaking paddles), it goes through several different of these cooking stages until at the end you have a very thick syrup, which is then poured into small brick shape wood molds, once the panela dries it hardens and the molds are removed.It is a very interesting process and just the trapiche part takes about an entire day, and of course as a kid you get to drink some guarapo and taste the cane juice syrup. 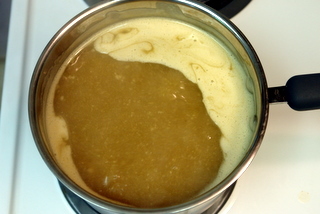 In Ecuador we use panela as most people would use sugar: to sweeten coffee, tea, juice, to bake and to make marmalades or fruit preserves; the panelas are kept in their hard brick form until ready to use and then they are melted down with water to make a syrup called miel de panela (panela honey) which is used to sweeten things, or it is also grated when used in certain dishes or for baking.Panela can be found in most Latin grocery stores or even in certain mainstream grocery stores. Naranjillas or lulos are another essential ingredient for this oat drink, it is hard to describe the taste of this great fruit, but most of time when I meet someone who has been to Ecuador and we talk about the food I always hear how much they loved the fresh fruit juices, especially the naranjilla juice.Even this basic version of colada gets complicated when you live far away from fresh naranjillas, luckily though it is possible to find the naranjillas either frozen or the frozen pulp at many Latin grocery stores, which is not the same as using the fresh ingredient, but it is still very close. I even remember making colada with orange juice when I first moved to the US and could not find naranjillas anywhere. This colada or fresco can be served ice cold or warm, most of time when we had it with breakfast it was just made and we would drink it warm, while in the afternoon when we got back from school we would have it cold, it also depends on what part of Ecuador you grew up in, if you lived in the Coast region you probably always had it ice cold, but if you lived in the Sierra or highlands you’ve probably had it both ways.Here in Seattle we like to drink it warm during the cold months and cold on those occasional hot days.You can also adjust the amount of water based on how thick or thin you would like the consistency of the drink, same thing applies to the amount of panela and how sweet you want the colada. WOWOWOWOW!!!! Just made this from your recipe and it is delicious!!! Thank you!!! Hello! I made several of your recipes for Equador Day at my daughter’s school. All have been delicious! 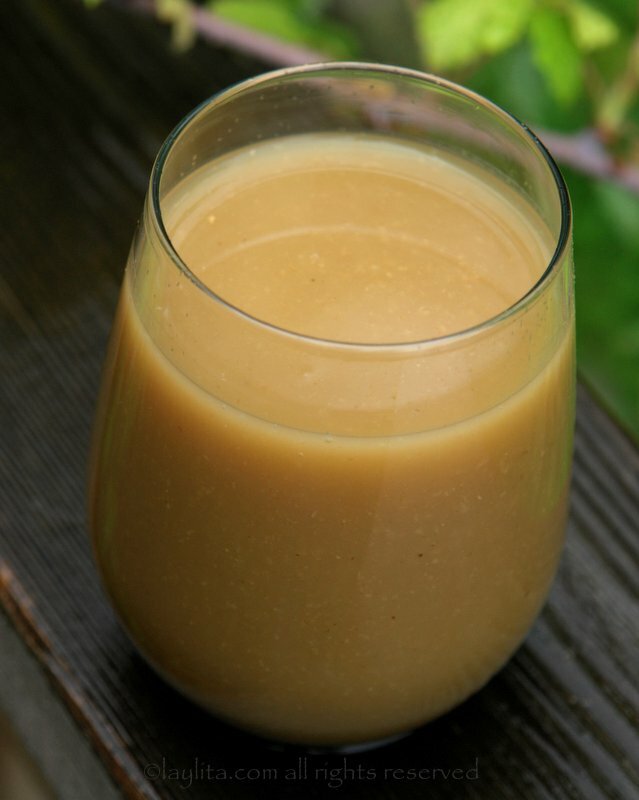 I want to make this colada, as well, but was wondering if I made it today/tonight, would it still be good tomorrow AM? Many thanks! Hi Tova – Yes, it will keep fine from one day to another. Just found this website for the first time today and I’m loving it! Thank you so much for all these delicious recipes. I’m Ecuadorian and enjoy cooking but don’t always cook Spanish dishes. My mom has taught me some Ecuadorian recipes but she doesn’t use measurements! It’s all eye-balled. She tells me, add a little bit of this, a little bit of that, some of this, some of that… so a dish never comes out the same way twice. Now I can come to this website that shows me step-by-step how to prepare these dishes I grew up with, what ingredients I need, and most importantly, how much I need. Today I went crazy seeing all these recipes. I made the seco de pollo, arroz amarillo (which, by the way, I had never prepared with the onions and annatto and it was delicious), platano maduro, and the colada. I added some avocado on the side… Omg, I had the best meal. Sorry mom, but Laylita’s recipes came out tastier than yours! (oh yes, I did. :) Great job with these recipes, Laylita!! Looking forward to preparing more Ecuadorian dishes now that I’ve found this website. “Drink this.”, my mother-in-law said after the birth of my first child. “What is it? I asked. She replied, ” Kwaka”. WHAT? Patiently, she explained to my bewildered, exhausted brain that it was an old Ecuadorean recipe of pineapple skins and Quaker oats boiled,strained, and pureed. New mothers were encouraged to drink it to rebuild strength and encourage milk production. Hesitantly, I swallowed and much to my delight, I loved it!!!! At what point in the recipe is the oats cooked? 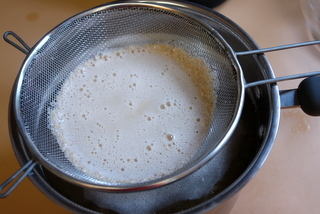 After boiling for about 5 minutes the oats should be cooked (step 6). I love this website. I am from Canada and my family is from Ecuador but I have never been and now I married a true Ecuadorian from Machala and he is always hounding me to make food from Ecuador and to be honest I don’t really know much. I went to school to learn Italian and Chinese food but since there are no Latin American cooking classes in Toronto I never really learned much. My family have always eaten foods from other countries. My abuelita always tried to teach me to make true Ecuadorian cusine but while she was living there wasn’t much places to buy the proper ingrediants. She always made amazing foods but she would complain that it is much better back home. To me the food was to die for and now we have stores everywhere that sell Latin American foods and OMG!!! Que Fabuloso!!! Your website has given me so many new dishes to try. I am truly grateful. Thanks for bringing back so many memories of my querida abuelita with these amazing dishes that I almost forgotten! This colada de avena BTW is SOOOOOOO WONDERFUL!!!!! Just like grandma’s!!! Gracias! 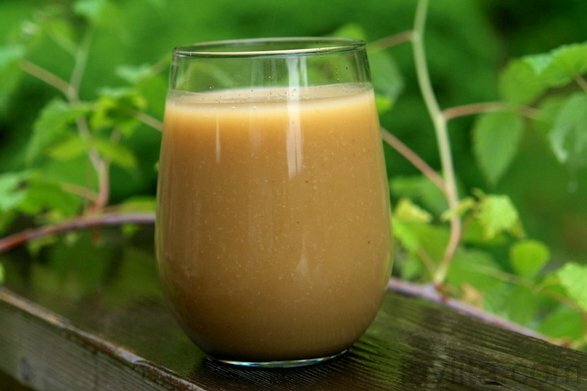 deliciosa la “colada” de naranjilla. 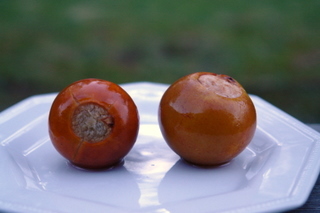 Tambien se la puede hacer con maracuya (“passion fruit”) y queda tambien muy rica. Esta colada jamas faltaba en el refri de mi casa en Guayaquil. Increible ver la receta de mi quaker!!!! soy de Guayaquil!. Alguien tiene alguna idea de que otra fruta ponerle en vez de naranjilla. Ahora vivo en Israel y no hay aca naranjilla, ni lulo, y maracuya hya solo en el verano…. Yo uso jugo natural de pina y naranja, me queda deliciosa. Espero te guste. omg…is this what i know here as cuaker? please tell me it is (o.-)? hi, thanks for a great page and recipe. 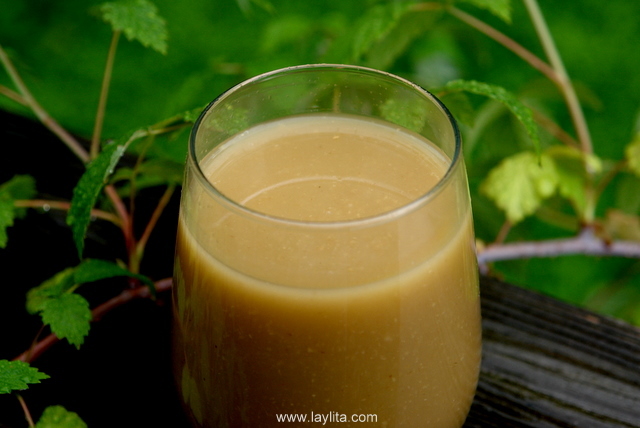 I have recently learned of panela and was wondering what to do with it except drink tea. I was also looking for ways to eat oats except for breakfast as I am hyperglycemic and need to eat whole foods, which this recipe is great for. Hola Laylita, Yo soy de Ecuador pero vivo en Sydney algunos anos y es dificil encontrar comida ecuatoriana aca. 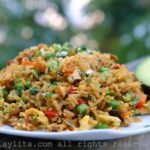 Tus recetas me han ayudado mucho a cocinar la comida de ecuador que extrano mucho. Your website is the best! 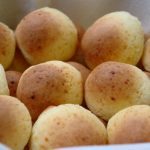 Yo estoy coleccionando tus recetas espero no te moleste! HELLO, THANK YOU VERY MUCH, FOR YOUR RECIPIES, I LOVE TO COOK AND I AM SO HAPPY TO FIND THE RECIPIES FROM MY BEAUTIFUL COUNTRY. ” THE QUAKER” IS THE TRADITIONAL BEVERAGE FROM ALL THE REGIONS, (COSTA, SIERRA, ORIENTE). I AM TO MAKE QUAKER RIGHT NOW!. THANKS AGAIN, YOUR WEB IS WONDERFUL. I made this last night! i used orange juice with pulp and brown sugar, it brought back so many memories of my childhood in Ecuador and especially my grandma who used to make it for me after school. This came out Exactly how i remembered it was perfect. Thank you so much for this recipe, i will make this for generations. dear laylita… thank you for all your recepies..! thank for let us enjoy the ecuadorian flavor. by the way… there is a drink very popular in the mountains its call rosero quiteno …. i was wondering if you could posted in your page… its really amazing… im from guayaquil… and the only place i can get it is in a restaurant called la canoa del grand hotel guayaquil… and its been years since the last time i had it.. thank you …..thank you…. and thank you…. Laylita: I have yet to cook a completely satisfying meal for my Ecuadorian husband since he moved to the US. Thanks for giving the step-by-step for all of us who are culinarily challenged!! I see that you said we can substitute the naranjilla with any other juice, but is the quantity? For example if I wanted to use pineapple. Thank you for your time in sharing all the delicious recipes from our beautiful country. Your recipes bring back so many memories of my childhood that I now plan on passing to my girls, thanks to you. Hi Margarita – You can use about the same amount of any other juice, so between 1 1/2 to 2 cups of juice, I recommend tasting it as you make it. Also, it depends if you use freshly made juice or store bought (usually has less of that intense fruit flavor). Thanks, I’m ecuadorian but actually I live in Italy, and I’ve been searching for this drink for too long. Today, I’m going to enjoy the Colada de naranjilla. My wife will be surprised. Thank you Laylita, I love your website; the pictures are awesome! I feel like cooking ecuadorian food everyday. I am from Ecuador but I was a little disappointed that I couldn’t find the ingredients that I needed to cook, but now I am opened to try different ways to cook Ecuadorian food again thanks to you. Question when I was in Ecuador I had “Quaker crudo” and in asking it did not have naranjilla but it did have vanilla and pineapple ….do you have that recipe? This sounds great and I’m going to try it but would like to make the other. I love your website and it is very helpful and I earn brownie points with my Ecuadorian husband when his Mexican wife makes the best Ecuadorian dishes. Thanks, your my best kept secret! Also, I couldn’t find naranjillas up here in Ottawa, Canada so I did a mix of frozen berries and fresh mango. Delicious! Reminds me of mulled apple cider surprisingly. I’m so glad to be learning about all kinds of Ecuadorian (and south american) foods! I love your drinks and your breakfast items especially! Gracias, Merci and Thank you! Thanks from Spain for the recipe. What is the equivalence bewtween cups and grames? We can find naranjillas in Madrid, but they are hard to find and really expensive, because they come from Ecuador and Colombia, altough the frozen pulp is not hard to find. Not the same about panela. It is the first time I heard that name. I will do it with dark sugar. I tasted this drink in a trip to Ecuador like 10 years ago, and I can’t forget how good it was. Thank you so much for this blog. I loved ecuatorian meals! Hi Lola – I use the US measure of a cup which for solids (oats) is about 200 grams per 1 cup. Hi, I live in England and they don’t sell naranjilla…What can I use as an alternative? Hi Mel – You can try to make it with any fruit juice: passion fruit, pineapple, orange, raspberry, etc. I am making this right now. It’s a cold morning in Quito and it smells dee-lish! Your pictures make stuff look really tasty. To be honest, I probably wouldn’t be enticed to try this at the local restaurants but I had to buy naranjillas and do it after I saw this post. You make everything look awesome and I am glad for that because it allows me to try lots of different types of Ecuadorian food. Now I can trick people into thinking I am an amazing cook! I live in Seattle as well, and I was wondering if you could tell me where you found (what looks like) fresh naranjilla. I’ve found the frozen pulp, but never the whole fruit. Thanks! Oh wow, this looks so good! Judging from the ingredients, I would probably love this! Yes, very interesting and healthy-sounding. Ay, qué bueno! No sabes cuánto quería una receta para colada de avena, o simplemente avena como lo llamaba mi familia quiteña. Justo ayer hice una (sin naranjilla) pero no me salió tan rica como quería porque no tenía panela ni sabía la proporciones correctas de agua, avena y azucar morena (que usé en vez de panela). Mil gracias por otra receta muy deliciosa y útil! A very interesting and healthy drink! It must taste wonderful!